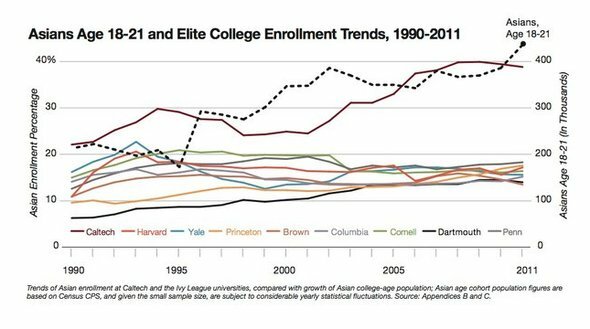 Last week, I posted a surprising finding with regard to the evidence — or lack thereof — of an anti-Asian American cap quota at Harvard. Spurred by the infamous New York Times infographic shown above, I asked whether Harvard’s published freshman enrollment data supported the popular assumption reinforced by the above graph: that Harvard’s Asian American population was stuck at approximately 20%, and had not increased despite increases in Asian American overall population size. It turns out that when you do the math, this popular preconception turns out to be false: in actuality, when you crunch the numbers with regard to changing applicant pool and falling admission rate, you find that Harvard’s admitted Asian American student population has increased between 2000-2014 at almost exactly the same pace as our national population growth. In other words, admission data simply do not support the conclusion that Harvard’s Asian American student population has been artificially capped to resist the last decade’s increases in Asian American overall population size. This is a problematic finding for Asian American opponents of affirmative action, because the belief that Harvard exercises an anti-Asian cap quota is one of the primary reasons they cite to argue that affirmative action is unconstitutional, and violates Fourteenth Amendment protections for Asian American students. Another major argument that Asian American opponents of affirmative action cite is that Asian American students are being admitted into Harvard at a lower admission rate than non-Asian American students because we are overrepresented in the applicant pool. Sounds like another testable hypothesis, albeit a harder one to really get at since the numbers aren’t published by Havard or any other private academic institution. Still, I asked myself today, is this also something we can crunch the numbers on?